Slightly curved at a 15° concave angle the downtown plaza bench with 3 comfortably spaced seats creates a comfortable seating area for walkways and sidewalks. Popularly installed in and around office parks and downtown areas. 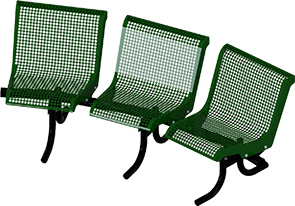 Featuring a cluster of 3 individual 24" perforated seats, supported with a powder-coated 2-3/8"O.D. steel frame for superior performance and stability. Built ready for all-weather use the all-steel seats are sealed with an ultra-resilient polyethylene finish.